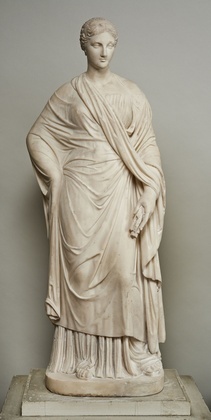 The current figures representing Ceres, Goddess of Agriculture and Fertility, Polyhymnia, Muse of Poetry and Dance, Pudicity and Flora, Goddess of Spring, are closely modelled upon four Roman statues dating from the 1st-2nd century AD all of which are still on display in the Vatican Museum, Rome*. During the 18th century the great interest in archaeology coupled with a desire to emulate the antique meant that such statues would have been widely known and familiar to both artists and patrons alike. 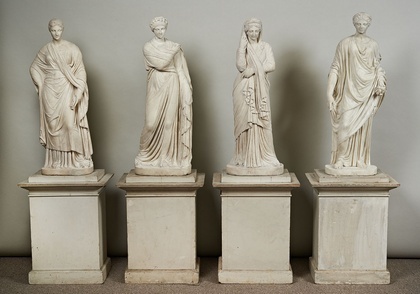 However the current figures are not mere copies of the Roman originals but have been endowed with an elegance and grace achieved by the skilful rendering of the draperies, the delicate carving of the heads and subtle changes to the position of the arms and hands. *Three of these are illustrated in �Francis Haskell and Nicholas Penny, �Taste and the Antique�, 1988, fig 22, p. 93, fig 40 p. 215-6, fig 74 p. 300.